Finally, the Philippines in on top of a list that is not negative. I am used to seeing the Philippines on top of the list of the most polluted, most corrupt, or most violent countries in the world. So, imagine my surprise to see the Philippines (no. 6) on top of the World Economic Forum's Gender Gap Index joining countries like Sweden (1), Norway (2), Finland (3), Iceland (4) and Denmark (8)! It is the only Asian country in the top 10. It seems that the Philippines is lost in Scandinavia in terms of gender equality. Studies show that we Filipinas edged our male counterparts in the education and training sectors from primary (87%), secondary (76%) and tertiary education (56%). There is also a significant increase in the number of female executives (97,000 women managers added in 2007 compared to only 16,000 men). My mom, I believe is the perfect example of a Filipina wonder woman. She is the best mom, best provider, good business woman, best grandmother and above all the best cook in the world. My sister probably is counted among the female executives mentioned above and a really brilliant one too! We are all about "women power" in our family. Get the full copy of the report here and read the full article here. Cross posted at Filipina Images. and this has implications for other issues as well. where women have more opportunities, family sizes tend to be smaller, helping to ease population growth. You are correct. Unfortunately, the Philippines seems to be an abberrant in terms of the population growth theory. if this will continue, it won't be long until filipina voices are heard globally! this is great news, but i wish the men would also take on more roles, more chores, and responsibility that women take. raising children isn't just the task of the woman, but as i've seen in my family, my dad left us to the yaya while my mom was working abroad. my dad is your perfect example of macho. more power to the filipina. i'm all for equality, but i still wish to be treated like a woman instead of a man. i'm not that macho. let's aim for equality in the eyes of the law. this is a good read http://www.pcij.org/i-report/2007/raising-men.html . it's an eye opener. 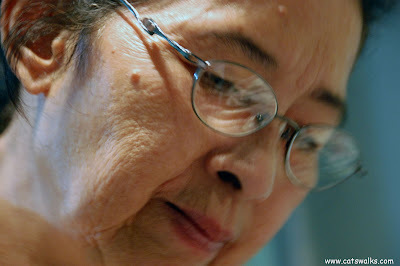 thank you for visiting my food blog and glad to read this piece about Filipino women... especially your mother. I have lived in Europe more half of my life and even had a short stay in Norway. These Scandinavian countries really reflect true gender equality. Issai- There is still room for improvement because we are just no.6! I think anyway that it is already big that Filipina women have an equal opportunity professionally. As women, we just have to educate our future sons to share household chores. Thanks for the comment! Shalimar- Women in Scandinavia also have a very long maternity leave around 6 months-1year. The men can take the same amount of time, I think in some countries. Thanks for the comment! Who is going to teach women to fix the roof when it leaks, or the electric or auto when they stop working? And who is going to expect them to do it?